Got writer's block? Take one of these and call me in the morning -- after you've finished the twelve week course that Cameron and Bryan have laid out for you in this book. I will then ask you, "How many days did you do your morning pages the past week?" If the answer comes back less than seven, I will suggest a cloistered order because the life of writer is not for you. I will place you in the same category as the wanna-be Miss Abs of 1996 in the Dilbert cartoon who said, "I bought the exercise machine you suggested, but I'm still lazy." This book is not for lazy people. Instead it is for industrious people who have poisonous friends who have thrown wet blankets on their every artistic endeavor, be it painting, sculpture, writing, or whatever. The authors put you on the exercycle of morning pages (free writing) for ten minutes every morning and urge you to use your newly developed will-power and discipline to take yourself on an artist date every week. Here is the plan in all its simplicity: 1) write freely, without editing or stopping for three pages every morning to clear the garbage from your psyche, and 2) spend time alone with yourself studying life and art once a week. 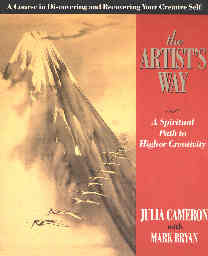 These are the two fine themes around which this fine book has been woven by Julia Cameron and her friend Mark Bryan. Since giving someone a suggestion (like "Buy yourself an exercise machine") is usually not enough to turn them into an athlete, Julie and Mark have given their course to many people in seminars and developed this book from it. If you've bought self-help books before, read them, tried some of their suggestions, and then forgotten about the whole thing, save your money. This book won't work for you either. If you are serious about freeing your artist within, buy this book, and use it as a workbook. Do all or most of the exercises at the end of each chapter. Do your morning pages and artists dates. Soon the latent artist within will pay you a surprise visit now and then. I read this book straight through during a weekend trip to Houston -- I loved the quotations sprinkled in the margins. I had discovered morning pages or free writing years ago from Peter Elbow (Writing Without Teachers) and I had been taking myself on artists dates for years, but The Artist's Way re-invigorated my resolve and I began my morning pages again. My book A Reader's Journal was the direct result of my first attempt at morning pages some ten years ago. While writing full-time for the past year, I'd dropped them until this book reminded of their importance. That rhythmic, repetitive action transfers the locus of the brain's energies from the logic to the artist hemisphere. It is there that inspiration bubbles up untrammeled by the constraints of logic. This is the process I call "collating time" -- it is the process of weeding a garden, sewing stitches on a quilt, of shelling peas, of loading shotgun shells, of shucking corn, of peeling shrimp, of doing something as mundane as collating pages from a printer -- if one does the operation carefully with full intention, inspiration will bubble up, freeing the artist within.